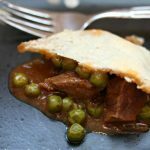 Tender, bite size pieces of beef stew meat encompassed in a flavorful sauce with peas and topped with a crispy pie crust. For the slow cooker: add onion, garlic, tomato paste, thyme, flour, chicken broth and soy sauce to the slow cooker. Whisk together until smooth. Add in the beef. Salt and pepper the beef to taste. Cover and cook on low for 6-8 hours, or until beef is tender. Stir in the package of frozen vegetables. Pour the filling into two pie tins. Gently top the pie tins with an uncooked pie crust. Pinch the edges of the crust. Bake for 25 minutes at 350 degrees F. Remove from oven and let sit for 10-15 minutes, then cut and serve. For the Instant Pot: add onion, garlic, tomato paste, thyme, flour, chicken broth and soy sauce to the Instant Pot. Whisk together until smooth. Add in the beef. Salt and pepper the beef to taste. Place lid on the Instant Pot and turn the valve to sealing. Press the meat/stew setting and set to 30 minutes. Once the Instant Pot beeps you can do a quick release by turning the valve to venting. Stir in the frozen vegetables. Pour the filling into two pie tins. Gently top the pie tins with an uncooked pie crust. Pinch the edges of the crust. Bake for 25 minutes at 350 degrees F. Remove from oven and let sit for 10-15 minutes, then cut and serve. This took a total of 40 minutes to cook in the Instant Pot. 10 minutes for the pot to come to pressure and then 30 minutes of cooking time. I used my 6 Quart Kitchen Aid Slow Cooker for this recipe.